Cole, Laurence; Hämmerle, Christa; Scheutz, Martin (Hrsg. ): Glanz-Gewalt-Gehorsam. Militär und Gesellschaft in der Habsburgermonarchie (1800 bis 1918). Essen : Klartext Verlag 2011 ISBN 978-3-8375-0409-5, 433 S. € 22,00. Überegger, Oswald: Erinnerungskriege. Der Erste Weltkrieg, Österreich und die Tiroler Kriegserinnerung in der Zwischenkriegszeit. Innsbruck : Universitätsverlag Wagner 2011 ISBN 978-3-7030-0493-3, 304 S. € 32,00. In contrast to the rise of Prussia, the Habsburg Monarchy has not received much scholarly attention for its military campaigns in the nineteenth and twentieth centuries. Grand narratives of Central European history, and the pivotal role of Germany in the twentieth century, make the Habsburg military seem located in the dustbin of history. The historical durability of the Habsburg Monarchy lends itself to literary caricatures of decline-and-fall because this makes a convenient story, conceptualizing a jumble of ethnicities, identities, and jurisdictions over the course of several hundred years. More recently, however, revisionist scholarship has stressed the need to evaluate the monarchy less teleologically: as an evolving civil society rather than a decrepit polity doomed to dissolution by the forces of centrifugal nationalism. Along with the Church and the bureaucracy, the Habsburg Army formed one of the key sources of support for supranational centralization, a “shield of the dynasty.” Nevertheless, the historical resilience of the monarchy begs the question of how the state and its military apparatus endured and adapted, especially in the monarchy’s transition to a more pan-European modernity. Situating their volume as an aspect of New Military History, Cole, Hämmerle, and Scheutz rightly argue that their book is an innovative application of cultural questions towards the Habsburg monarchy’s military relations with civil society. Indeed, prior to this book, the only high-quality long-range comprehensive assessment of the Habsburg military is the edited volume in the series of the Österreichische Akademie der Wissenschaften, which still remains a solid starting point for a history of the political and administrative actions of the post-1848 military. Individual monographs have added much more colorful portraits, such as István Deák’s splendid survey of the officer corps, or Gunther Rothenberg’s fine study of the Army during the era of Kaiser Francis Joseph, the embodiment of the monarchy in its twilight era. For the most part, however, we still lack a military history of the Habsburg monarchy as cultural history, especially compared to the work done on Germany. The essays in this volume stem from a 2008 conference in Vienna, held as a research workshop that explored concepts of New Military History applied to the Habsburg Monarchy. Although standard caveats apply about the unevenness of the essays as a group, the volume goes well beyond mere conference proceedings. It not only contains several thought-provoking essays, but also includes an ample bibliography and even an excellent essay on the historiography and practical usage of military records at the Austrian State Archives, written by a high administrator there, Michael Hochedlinger. These materials render the volume especially useful for those scholars making first forays into the Austrian military archives. The introductory essay by Laurence Cole, Christa Hämmerle, and Martin Scheutz, outlines the volume’s three themes of glamour (“officially sponsored celebrations, rituals, and pictures”, p. 20), power (in the Weberian sense of the state monopoly of violence), and obedience (where the military was the “schoolmaster of subjects”, p. 25). Overall, the editors offer an excellent historiographical outline as well as a plea for research in two future directions: first, to see beyond clichés of the military as an element of loyal solidarity, instead viewing it as a “polarizing” institution that both attracted and repelled citizens; and second, to evaluate the Habsburg military in a more pan-European context (pp. 27-28). In the first section, Christa Hämmerle’s essay on the role of drill in units in the monarchy’s western half from 1868-1914 emphasizes that excessive discipline undermined the simplistic ideal of the “citizen in uniform.” Angelique Leszczawski-Schwerk’s piece explores idealized legends about Polish and Ukrainian female legionaries during the First World War. Martin Scheutz’s essay shows the multifaceted dimensions of war correspondence and academic politics between three prominent Austro-Hungarian historians during the Great War. Alon Rachamimov’s chapter examines the morale-building efforts of Austro-Hungarian officers in Russian P.O.W. camps, also during the Great War. In the second section, Rok Stergar’s chapter explores the attitude of the Slovenian people to the universal conscription in the post-1868 era. Catherine Horel’s essay looks at the Croatian-Slavonian military border from a Hungarian context; it is the only essay to engage the Transleithanian or “Hungarian” perspective directly. Nicola Fontana’s case study of a fortress town examines civil-military relations in Trient from 1880-1914. Martin Zückert’s essay on Czech political protests uses the concept of Resistenz applied to antimilitarist movements up to 1918. In the third section, Leighton James’s chapter is the only one to address the pre-1848 era, looking at Austrian historical memories of the Coalition Wars of 1792-1815 in light of the sources of a former officer in the hussars. Laurence Cole’s essay examines the memory politics associated with the cult of Marshal Radetzky from 1848-1914. Maureen Healy’s splendid piece examines the complicated notions of “friendship” associated with Austrian images of the Turks before and during the Great War, as the historical threat of 1529 and 1683 became a nominal ally of the Central Powers. Oswald Überegger’s highly theoretical essay examines Austrian war memorials and local communities of memory, with evidence largely drawn from Tirol and the Great War. In the final section, Karin Winter’s essay examines the Austria-Hungarian navy, looking at the world tour of the Austrian ship Erzherzog Friedrich, to offer micro-level perspectives about imperial issues of naval administration. Hannes Ledinger’s chapter on military suicide looks at Reichsrat debates from 1907-1914 and the consequent conflicting political agendas. Finally, Verena Pawlowsky and Harald Wendelin’s chapter on war invalids highlights the bureaucracy’s systemic failure to cope with caring for the wounded during the Great War, with the irony that these inadequate measures helped lay the ground work for later successful developments of the Austrian welfare state. Pawlowsky’s and Wendelin’s piece is one of the very few in the book that directly addresses the post-1918 effects of the war. Despite the new perspectives on civil-military relations, most of the volume’s essays unintentionally highlight a deeply ingrained reliance on familiar narrative conventions of historical writing on the monarchy, particularly regarding the neglect of the Great War and its legacy. Most glaring in this regard is the issue of chronology. Of the essays that deal with the twentieth century, many stop in 1914, let alone 1918 or after. It bears emphasizing that, though the monarchy fell, everyday military experiences of common soldiers and their networks continued to have much more independent relevance beyond historians’ convenient chronologies. The Überegger volume under review highlights in extreme this problem of continuity and change. Here, at last we arrive at a military history that takes into account not only the Great War, but also its pre-war tendencies and post-war legacies. The book is a model of the types of questions that should help to structure debates about the nature of the Habsburg military. Firmly situating itself as an empirically grounded local history of Tirol with larger theoretical relevance for Central Europe, it builds on a rich history of recent work that has made the Italian Front an exciting arena of collaborative scholarship in which the current monograph author has played a leading role. Überegger’s current book is a study of the curiously under-researched “mental and psychosocial effects” (p. 9) of the First World War in Austria, conducted through a multi-level examination of contested memory politics among individuals, institutions, and groups. The study is thoroughly based on a range of state and local archives, though strangely restricts itself to the present-day borders of the Austrian Bundesland of Tirol, which, for the period of study, is an anachronism. The book’s initial empirical chapter elaborates variegated media discourses around three main topics: war guilt, the notion of a stab-in-the-back (Dolchstoss), and representations of defeat. Further chapters discuss the role of “military cultures of memory,” especially focusing on a group of officers who played a disproportionate role as memory-shapers, and the notion of war memorials as contested places of memory. As Überegger argues, these officers’ memories (and their present political actions) often diverged sharply from those of ordinary Tirolean soldiers. While on one level unsurprising for general military history, on a deeper level these findings offer a much more variegated view of the Habsburg military culture, in which for too long the literary cliché of a unified officer corps has remained the only historical agent. In Überegger’s view, the officers who largely shaped the official public representations held a deeply embittered view of the war, overstressing the notion of a loyal army “unbeaten in the field” and an “ungrateful homeland” (pp. 254-55). Überegger eviscerates the notion of a Frontgemeinschaft of soldiers solidified into a band of brothers by their war experience. Instead, as he convincingly argues, for the vast majority of Tirolean soldiers, the war “did not represent a deep-reaching, lasting caesura” (p. 256). The majority of soldiers experienced the war longing for the normality of everyday life, eagerly embracing and returning gratefully to civilian life. In line with Benjamin Ziemann’s work on Bavaria, Überegger makes a powerful case against a caste-specific military brutalization; instead, he argues for pre-war continuities of local, rural life. Further chapters show the persistence of religious traditions as a fundamental orientation point of rural people, combined with the relative apathy of the Tirolean youth culture toward the political agitation represented by embittered former officers. Yet the final chapter is unsatisfying and does not fit easily with the previous chapters that stress common soldiers’ idealized longings to return to pre-war norms. In this chapter, Überegger questions the notion of a mythic mountain war, a romanticized Alpine pastoral legend especially drawing on the anti-Napoleonic resistance of Tirolean heroes such as Andreas Hofer. Instead, Überegger reminds readers that the Italian Front was a fully modernized and mechanized case of industrial warfare. Despite Überegger’s previous stresses on continuities, in this chapter he argues that the Great War was also qualitatively and quantitatively a new type of warfare for the Alpine region and its inhabitants. Thus, one is left wondering about the disjuncture between ideals and material reality in the common Tirolean soldiers’ experiences of the war and its aftermath. In any event, such arguments will continue to be a subject of contention for representations of the Italian Front. These reservations aside, the book raises fundamental questions that will help to advance debates about the social history of memory and the role of the military on local and imperial levels. Taken together, these two books under review are groundbreaking works of talented scholarship. They belong on the shelf of every researcher interested in examining the modern military history of the Habsburg Monarchy beyond literary caricatures. For two solid representative pieces of revisionism, see Gary B. Cohen, Nationalist Politics and the Dynamics of State and Civil Society in the Habsburg Monarchy, 1867–1914, in: Central European History 40 (2007), p. 241-78; Jonathan Kwan, Nationalism and All That: Reassessing the Habsburg Monarchy and Its Legacy, in: European History Quarterly 41,1 (2011)., p. 88-108. Gunther E. Rothenberg, The Shield of the Dynasty: Reflections on the Habsburg Army, 1649-1918, in: Austrian History Yearbook 32 (2001), p. 169-206. Adam Wandruszka / Peter Urbanitsch (eds. ), Die bewaffnete Macht. Vol. 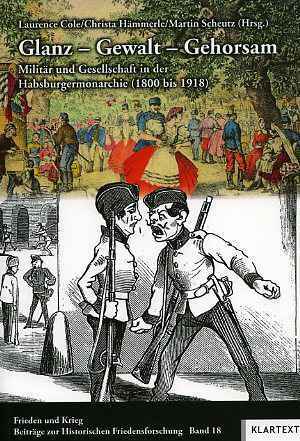 5: Die Habsburgermonarchie 1848-1918, Vienna 1987. István Deák, Beyond Nationalism: A Social and Political History of the Habsburg Officer Corps, 1848-1918, Oxford 1990; Gunther E. Rothenberg, The Army of Francis Joseph. West Lafayette, IN 1976. Oswald Überegger (ed. ), Zwischen Nation und Region: Weltkriegsforschung im interregionalen Vergleich: Ergebnisse und Perspektiven, Innsbruck 2004; Hermann J. W. Kuprian / Oswald Überegger (eds. ), Der Erste Weltkrieg im Alpenraum: Erfahrung, Deutung, Erinnerung/La Grande Guerra nell'arco alpino: esperienze e memoria, Bozen 2006. Patrick Houlihan: Rezension zu: Cole, Laurence; Hämmerle, Christa; Scheutz, Martin (Hrsg. ): Glanz-Gewalt-Gehorsam. Militär und Gesellschaft in der Habsburgermonarchie (1800 bis 1918). Essen 2011 / Überegger, Oswald: Erinnerungskriege. Der Erste Weltkrieg, Österreich und die Tiroler Kriegserinnerung in der Zwischenkriegszeit. Innsbruck 2011 , in: H-Soz-Kult, 13.03.2012, <www.hsozkult.de/publicationreview/id/rezbuecher-16200>. Copyright (c) 2012 by Clio-online and Arbeitskreis Historische Friedens- und Konfliktforschung, all rights reserved.